ST. CROIX — It’s 10:15 p.m. and the only thing that could be heard in Brandys Scott’s 15 X 15 foot. dorm room was the steady tapping of the pen on her wooden computer desk, coupled with her rhythmic breathing as she pondered over the last question of her psychology homework. The loud sound of her phone vibrating on her wooden desk quickly breaks the peaceful silence that had enveloped the room as she received a notification. Putting her pondering on hold, she picks up the phone and burst out in a hearty laugh as she watches a Snapchat video her sister sent of her trying on her Halloween costume and doing the popular shmoney dance at the same time. Clad in Joe Boxer smiley face pajama bottoms and a wife-beater, Brandys got up and went through her door, still laughing at the Snapchat video by her sister in search of the restroom. Reenter the room with a smile still on her face, Brandys went back to her wooden desk to resume her search for the answer to that last question. The blaring sound of her iPhone’s ringtone flooded the room as a sleepy Brandys answered, “Hello” followed by a frantic “I’ll be right down.” She forgot that she had an 8 a.m. work meeting and her coworkers were all waiting for her to arrive. Hustling out of bed, Brandys rushed out of her room and into the bathroom to brush her teeth and wash her face. Then she quickly got rid of her smiley face pajama bottoms, pulled on a pair of jeans that were at the foot of her bed, grabbed her AKA varsity styled jacket from her closet and ran through the door. Entering her room shortly after 9 a.m. from her early morning work meeting, Brandys shrugged her jacket off and put it over the back of her wooden computer desk chair. Moving over to her micro fridge, she opened the door and took out a Capri Sun juice pouch which she drank all while standing in front of the open fridge. Discarding the now empty pouch in the trash can by her computer desk, she glanced over to the top of her desk where she had multiple brightly colored Post- it notes lining the top of looking like a trail of Skittles neatly lined off. A puzzled look filled Brandys face as she stared at a fuchsia colored Post-it note before walking over to her desk sized calendar that she had propped on the back of her door to confirm the discrepancy. She realized that today was SGA’s Open House for which she was supposed to be a guest panelist and it slipped her mind. After making a quick phone call to confirm her attendance time at the panel, Brandys grabs her towel and shower caddy and leaves the room. Shuffling through her dresser drawer looking for her ‘SGA Nice’ shirt, Brandy’s room has an air of comfortable chaos. Her bed is unmade with the fitted sheet lifting slightly at one end, folders and textbooks on one side of the bed, her psychology text and book from last night’s homework session were still open, six pairs of shoes were scattered throughout the room, sticky notes on her computer desk, and a pile of clothes were piled on her extra wooden chair. Listening to Pandora’s Beyoncé radio, Brandys is sitting in the hallway mirror curling her hair as she sings “Flawless”, a popular song by the international singer. Hair curled, Brandys applies a coat of lip gloss to her lips and mascara to her eyelashes before she unplugs her curling iron and walks back into her room. Powerwalking to the UVI Great Hall where the panel was set to take place, Brandys sat and listened attentively as the other speakers spoke, checking her phone occasionally to see what the latest updates were on her Instagram. When the MC announced for her to come to the front along with the other guest panelist, Brandys went up and began speaking about her experience at UVI. Manning the decorated AKA table at the open house at the cafeteria, Brandys sports her AKA jacket while speaking to the young ladies about the organization and how they can join. Between her three classes, running around to Kmart and Cost- U- Less, psychology club meeting where she got goodie bags prepared for their upcoming bake sale – a high- spirited Brandys still managed to attend the happy hour program that was put on by a university organization that night and won the intense game of beer pong with her team. “I consider this the perfect opportunity to improve my time- management skills and practice learning how to balance everything that’s happening in my world in preparation for my life post college,” an extremely frazzled looking Brandys said as she climbed the two flights of stairs to her second story room. It is now 11 p.m. and as her room door closes, you could hear the scraping of the wooden computer chair being pulled out as Brandys prepares for another late night filled with homework and possibly funny Snapchat videos. 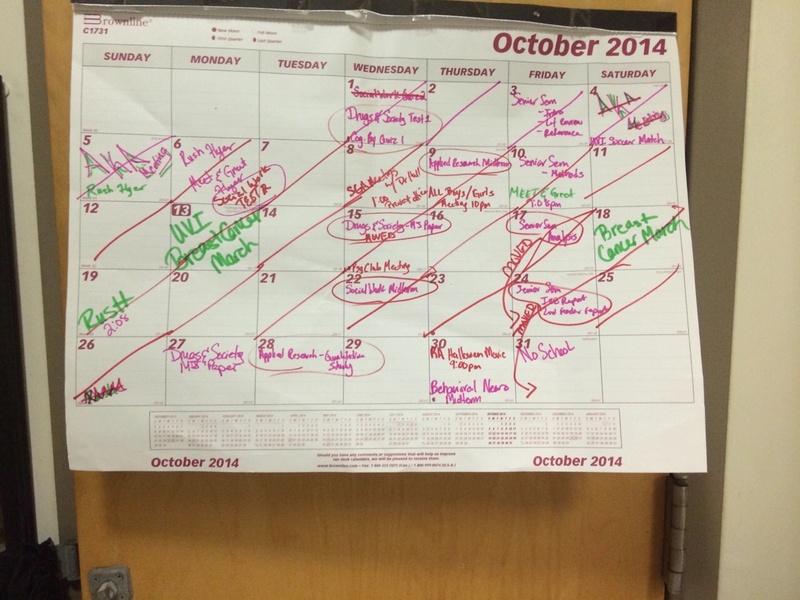 Brandys Scott’s marked off calender of events that have passed.